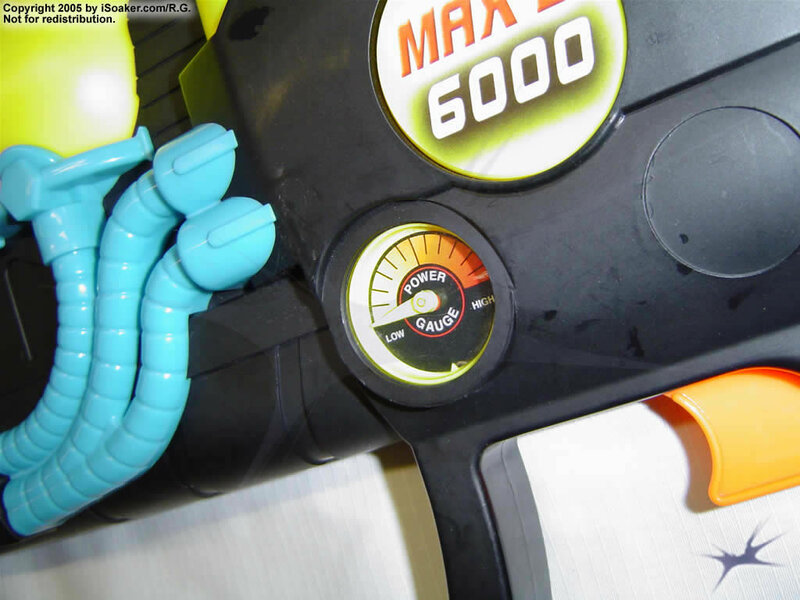 The Super Soaker Max-D 6000 is the largest of the 2002 Max-D line of Super Soakers. The Max-D 6000 makes an excellent medium assault rifle. It holds more water than its cousin, the Super Soaker XP 310. While its dual pressure-chamber system actually holds less water than the Super Soaker XP 310, the Max-D 6000 gives better performance on each of its nozzle settings. It also has a pressure gauge to make it simple to tell how much pumping is needed to attain adequate pressure. Range comparison testing has been done looking at the performance of the Max-D 6000 versus the Super Soaker XP 310. 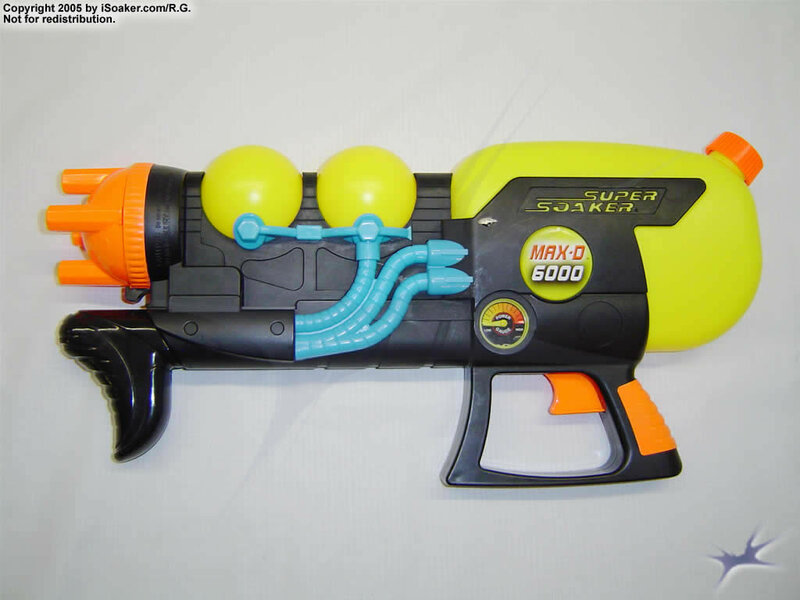 Preliminary results suggest that the Max-D 6000 outranges the Super Soaker XP 310 by 7-8 feet when firing level with the ground at a height of about 4 feet. The Max-D 6000's water reservoir is translucent and water levels can be easily checked. It has four XP-class nozzles to choose from, the smallest being about classic-nozzle size while the largest appears a little larger than XP (perhaps slightly over 2x). This offers a longer firing time when on the lowest setting versus the largest (about triple, actually). The nozzles are switched by rotating the nozzle-selection know which makes up the front of the blaster. Each nozzle setting slides and locks into place. The reservoir comes with a tethered cap to help prevent the cap's loss. Pumping is quick and easy, giving this XP-class weapon a good punch. Its size and balance are nice, allowing one to hold one's ground even against the lower CPS-class weapons. The side-mounted pressure gauge lets one pre-pump the firing chamber to a definable pressure using air before loading the firing chambers with water. The trick is to pre-pump the firing chamber with air until the pressure gauge is about 1/3 the way to maximum. 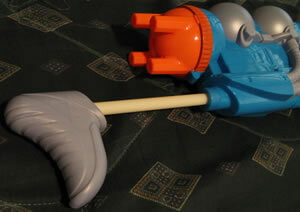 This can be done by holding the blaster upside down and pumping. The added air pressure in the firing chamber will make the water stream behave more CPS-like. However, the firing angle is still limited. An interesting thing to note is the trigger and firing mechanism. 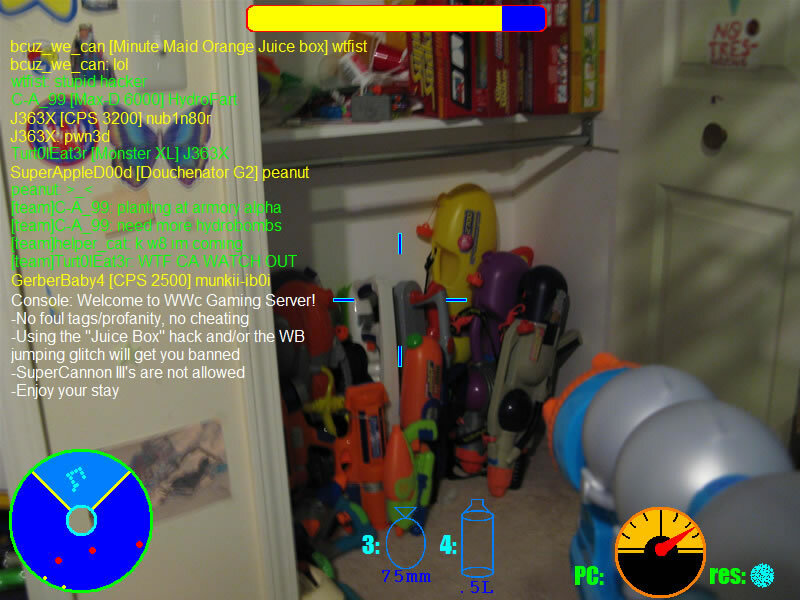 When pulling on the trigger, no water is released until the trigger passes a certain point upon which a clicking sound is heard and felt as water bursts forth from the nozzle. 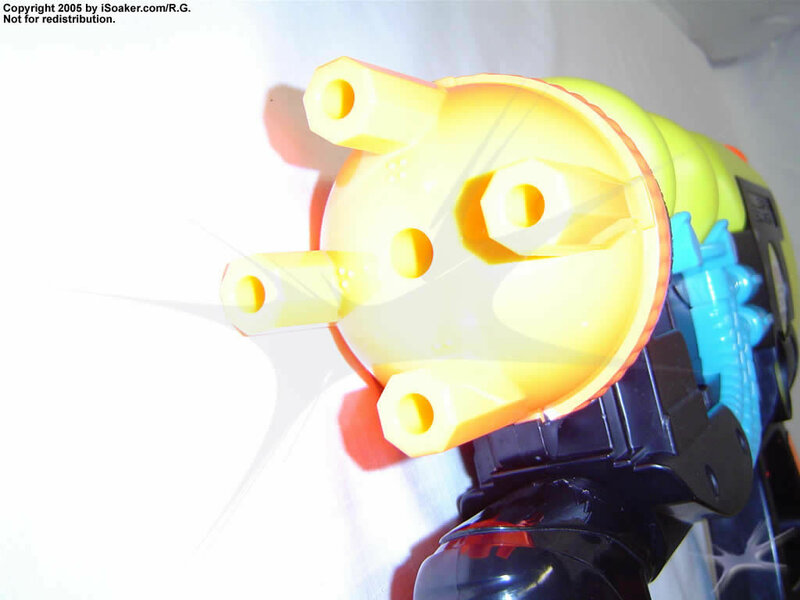 It should also be pointed out that it is the bottom nozzle, not the top nozzle as seen in the Super Soaker XP 310, from which water is expelled. This suggests a rather different firing mechanism on the inside of this blaster. Great even as a primary weapon, the Super Soaker Max-D 6000 is perfect for small to medium skirmishes and can hold awhile in large ones. Just beware of any CPS-class weaponry as well as larger XPs and XXPs. Nice size, light, easy to carry. Despite its size, it packs respectable power. It also does not take too much effort to pump up the pressure chamber. The tank provides a respectable amount of water considering its rate of fire. Easy to fill with a nice, tethered cap and translucent water reservoir. The reservoirs intake is at the bottom, allowing virtually all its water to be used. The pressure gauge is also good for figuring out how much more pumping needs to be done. The four XP-nozzle settings offer some flexibility on water usage plus they look nice. This is a rather small weapon compared to the others out there. No strap. The trigger guard area and grip is a little short, meaning that larger hands will not be able to have all fingers on the grip comfortably. The Max-D 6000 was originally released in 2002 along with the rest of the Max-D line. These were Larami's first guns to use ball valves, which function better for linear flow on smaller streams. With small streams, a valve with larger flow is not needed, and with smaller pipe diameters, the pull valve was not as practical for having streams shoot farther. Other design improvements could also bear responsibility for having Max-D's perform better than the line they were intended to replace; the Xtra Power line back in the 90's. The Max-D 6000 also features 4 nozzles on a rotating selector, a pressure gauge much like those found on bike pumps, and 2 air pressure chambers. The entire design is basically based off of the XP 310, the main differences being in power, pressure chamber size, reservoir capacity, and the trigger guard. This review is based on the MK VII. 2008 version of the Max-D 6000. As far as I'm concerned, the only differences between this and previous Max-D 6000s is the coloring and whether its sold individually or in twin packs. Nozzles: The nozzle selector gives you 4 options: small, smaller, really small, and just plain tiny. Handling: The trigger guard is designed to go around the entire hand like on most Max-D's. Unfortunately, those with larger hands will likely have trouble with this. However, it does give more space than the hand cramp given by the MD3k and MD4k pistols. Pump: The pump is pretty standard. It is very easy to use and pressurizes very quickly without the handle being too small nor the rod being too short. The handle is a bit unconventionally shaped, just like on the XP 310. It kind of acts like a foregrip and if the pump was harder to pull out, the handle design would be a problem. Otherwise, it works fairly comfortably. Trigger and Valve: The Max-D line introduces Larami's first guns to use ball valves instead of pull valves. But they also went farther and created a way to have them behave differently than conventional trigger valves. The idea behind the new valves is to have them open quickly and close quickly, but misconceptions at the time thought that this was what improved performance when in fact, the increase in performance was due to more linear and open flow from the pressure chamber to the nozzle due to the new valves. 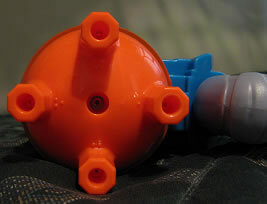 Rather than having the valves open and close simply, as Buzz Bee Toys did on most of their blasters, Super Soaker used a rotating piece with a rod and spring connected to the valve's arm. When pulling the rotating piece back, the valve starts to open, then, because of the angle of the force applied, the spring causes the valve to fling back quickly. When closing, the spring on the rotating piece rotates the valve back to closed, and again, does so quickly. 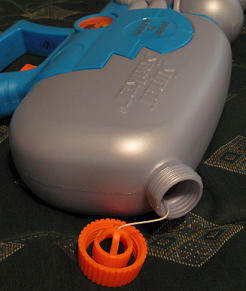 The valve, having first been on Max-D's, is known as the Max-D valve and has seen wide usage across recent Super Soakers. Despite the advantages of the new valve for low-flow applications (small streams), they are often very poorly done and tend to break very easily. The design doesn't use the best springs and often places much stress on them. Other parts of the valve are also prone to breakage, though the spring is the most common. If it doesn't break, the next problem is the spring weakening, which is more likely (in most cases) than breakage. Spring weakening causes the valve to not close all the way, which causes the nozzle to leak. If a Max-D valve or a valve in a WW is leaking, pull the trigger all the way back, then slip your finger off to the side to get the valve to snap shut. This should usually stop the leak. Details on repairing both Max-D and WW valves can be found on the Super Soaker Central forums as well as through some posted articles in the repairs section . However, the repairs are usually not that reliable, but finding a correct spring is not always easy. Tactically, the trigger may take a few shots to get used to since they make a loud clicking sound when pulled and released. They are a bit harder and less easy on the finger than the old valves, and pulling off rapid tap shots with them is not as easy. That said, the trigger action is still quick and not sluggish like the simpler ball valve system used on WW's and performing tap shots is still very easy. Pressure Chamber: The pressure chamber is simply 2 hollow bulb-containers. Inside the reservoir, there is a hole at the bottom where the water goes through. When pulling the pump outward, water gets sucked through this hole to fill in the extra volume created by the pump. The water goes through a 1-way valve, or a check valve, and when the pump is pushed, it pushes the water through another check valve which leads into the pressure chambers. Since the air already inside the PC's have nowhere to go, they'll "float" to the top and get compressed. When the trigger is pulled, the air decompresses, which pushes the water out. To pre-charge the PC, invert the reservoir (if it's filled) so that when you pump, air, not water, is getting pumped in. The extra air helps lower drop-off, which is when the stream slacks down and doesn't go as far as its supposed to when the PC is nearly emptied. As always, a pressure relief valve is present that returns air/water to the reservoir if you attempt to pump at full pressure. It is noticable when pumping becomes difficult and noises are made by the valve. Pre-charging, therefore, lowers the amount of water that can be shot, but without pre-charging, half of the water is basically no use since it won't go very far when the air pressure is nearly gone. To fully load, perform the pre-charge and regular pumping, then top off the reservoir. The Soaker is now at full capacity (and power). Reservoir: The reservoir will last several full shots but still goes out in not too long if one is making long shots and not conserving ammo. The shape is considerably crunched, limiting the capacity somewhat, but it makes the whole blaster light and easy to handle. The lack of a strap and carrying handle may be somewhat annoying to some, but they are not absolutely necessary. Tactical Usage: Since its light and doesn't have as much range, capacity, and output as other blasters, the MD6k is really only useful as a secondary, or as a light primary for warriors carrying heavier equiptment. (such as loads of water balloons and/or a launcher) It is however, fairly useful in drive-by's and in wars where larger soakers such as the top of those from the CPS line are not present. If facing against such users is inevitable, take advantage of speed and shot time since thats how the blaster is pretty much meant to be used. Just conserve ammo enough to avoid running out of water and to be able to maintain pressure. As a secondary, either avoid fully loading it, or use it at the same time as another weapon to avoid having it weigh down too much. Alone, it is very light and fast as I said earlier. Overall: The range and power feels sufficient enough for its size. The nozzle options don't provide a good selection for this blaster. As I mentioned earlier, the trigger is also very likely to break. I've only had mine for a few months and didn't use it much, but I've heard numerous reports about their triggers breaking - just look at some Amazon reviews. 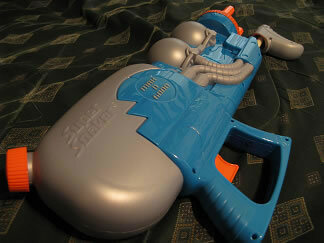 Against the current market of water guns, you'll definately find some better blasters than this - go for them first. But if you need an extra, cheap, simple blaster, keep this one in mind. Unmodified, it may not be as "good" as the Flash Flood, Arctic Blast, or Orca, but its a 4th option to consider if you need something very light and easy to use. Compared to the Flash Flood, this one is much easier to pump, though obviously won't give as much of a nice surprise on its largest available nozzles. For the sake of simplicity, and to follow the markings on the nozzles, nozzle 1 will be the largest while nozzle 4 will refer to the smallest. This section is divided up into various data. The list was too long to make into a table. There are 3 categories when dealing with shot time, range. and PC size. Full volume is where I tried to fill up the pressure chambers as full as they could get by pumping in water, inverting the gun, and shooting out air from the pressure chamber area. Since the PC's on my MD6k are very slightly translucent, I was able to tell when only a small air bubble remained in the PC's. The next category is standard, where the PC's are completely emptied, then water pumped in normally. After that is the pre-charge, in which I went with 15 pumps. For the full volume category, only PC capacity was measured. (since measuring anything else w/ that would not be practical at all) For ranges, all numbers go with the 15 pump pre-charge. Ranges taken with nozzle about 1' 4"above ground. Very sight wind, unperfectly even ground, lineup of measuring tape, etc. may affect results, especially on small nozzles. Range was gone by rough average of the center of the water pool created, not by last drop. All ranges taken with 15 pump pre-charge. Shot times taken by stopwatch function built into my watch. Watch is stopped when air is heard coming out of the nozzle. All shot times are taken w/ blaster relatively level so as much water can be used as possible. Output and pump volume directly calculated using total PC size / Shot time, and PC size / # of pumps, respectively. The data is for reference only. Many measurements were only taken once, using conventional household equiptment. Due to the lack of being very scientific, as well as the manufacturing process, results across the same model will probably differ. Soaking Power: The overall feel of power from the streams and their ability to soak targets far away and up close. Shot Capacity :: How long and effectively the blaster lasts on its given capacity. Also factors in PC size and ability to recover and re-pump from big shots. Ease of use: Handling and ergonomics in how the blaster is designed. In this review I'll be reviewing the Max-D 6000. Yes, this IS an older blaster, but I'm reviewing it anyways! This baby can shoot up to 40 feet (I thought it should be further?) at a 60-70 degree tilt! It has four nozzle selections and a presssure gauge, but the pump feels a little weak. It's a light blaster and I recommend using it as a backup as there are much more powerful blasters out there now. It has a so-so black, yellow and red paint scheme and no CPS. Unlike the newer blasters, it doesn't have any "special" features. As mentioned earlier, using this blaster as a backup is the wise choice because A: It shoots 40 feet! B: It's light. A couple downfalls are that it's a two hand blaster and doesn't have a strap for duel wielding. The MD 6000 is similar to the XP 310, but shoots further, is less durable, holds more water, and uses it quicker. This is a great light gun, dual wieldable with minimal effort. It comes with no strap, and no strap is needed. A cause of concern is the trigger system, which has an extremely high chance of breaking. This can be repaired, but is difficult. Heavy use encourages breakage over time, so watch out for that. The pump also is slightly weak feeling, pump with care. It only takes about 8 pumps to load this thing! The shot time is also really good. The pressure gauge is helpful, but it will fog over time. I've had 2 MD 6000's; both; sadly; had their trigger systems fail. The MD 6000 is a good gun [while it lasts]. Scout, skirmisher, etc. The more experienced will be able to pull off grunt and other similar roles. Avoid large CPS guns, especially in the hands of a skilled user. A skilled user of one of these powerful guns could potentially sweep you right off the field, so bring your best tactics and fight in groups. I use this weapon as a co-backup (along with a Monster X) to my CPS 2700. It's rather light and, even when full, I can swing it around with one hand. The gauge makes pumping convenient once you learn about how many strokes you need based on whatever level it may be on. The Max-D 6000 is a fine addition to any warrior's arsenal. I bought my Max-D 6000 about a week ago and when I went to test it out, I became very happy with the results that I got from it. 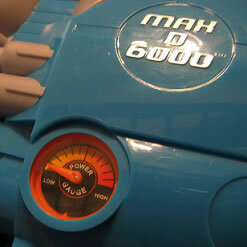 One very nice thing about the Max-D 6000 is that it has a pressure gauge (called power gauge on the blaster itself) that tells you how much pressure you have available before needing to pump it up. I also like the four nozzle settings. I find that the number one nozzle works best if you don't like to pump a lot and that the number four nozzle works best if you have a tendency to like to really soak people in one shot. I did though get a different coloring scheme on mine when I bought it ( purple and gray ) although you might want to paint the orange parts of it so it doesn't stick out. I would recommend this blaster to anyone who really likes to soak the person in one shot. I'm referring to the number four setting. Well, that is my review. This is a great assault rifle. It has a large reservoir for its size plus a power gauge! It is easy to pump, very light, and even features a separate pressure chamber. This soaker also out-distances most of my other blasters, so you can snipe with this one. The multiple nozzles are also sometimes useful, using the smallest for conserving water and the largest for larger water battles. Some nozzles, like the two in the middle (based on size), are not needed. Cons: Too many nozzles. Only smallest and largest are needed. Cannot match up against larger CPSs. I got this Max-D from Walmart (when on a holiday in Orlando from Britain) and I was determined to get a Water Gun that wasn't available from England. I suddenly saw how cheap all the Super Soakers were! My XP310 cost me £15 (About $20)! I saw the Max-D 6000 and was on sale for $13 so I took it (well, paid for it as well). When I got home, I tested it, "Isn't it easier to use than the XP310?!" It hardly leaks and the stream of water's range is really cool. My friend has a CPS1200 and it out ranges it easily. The Nozzle Settings are much more useful from the XP310's 1x, 1.2x, 1.4x and 2x, instead with the 0.8x (very effective when you're planning to spare water, but annoying if there's a strong wind), right up to 2.4x (good for short skirmishes and assaults and very good at hosing people down in a quick burst of water. The new handling makes it easier to hold (not for bigger hands), and when you pull the trigger, you hear a click: that is the valve opening to let the water to go through. When it is closed, no water can leak out the firing chamber. The colours are different and have character. Besides that, I like that orange, yellow, black and blue look. Overall, this is a great, light, good looking water blaster that packs quite a punch for its size. Good choice of nozzle settings all in a small, light and powerful soaker.